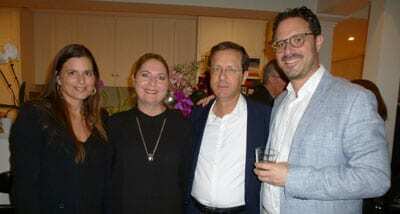 Isaac ‘Bougie’ Herzog, Opposition Leader of the Israeli Labor Party in the Knesset and newly elected Chairman of the Executive of The Jewish Agency for Israel addressed 150 guests across various events hosted by UIA NSW as part of his visit to Australia this week. These events included a Presidents Division Cocktails and a Boardroom Lunch. 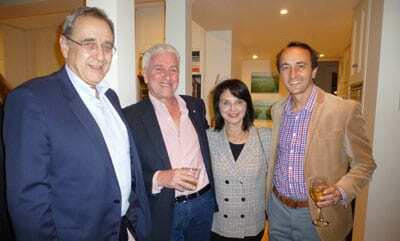 Herzog’s wife, Michal was the guest speaker at an intimate event for UIA NSW Women’s Division executive members. Herzog, son of the late Israeli President Chaim Herzog, is the former chairman of the Labor Party and continues to serve as the opposition leader in the current 20th Knesset. He contested the 2015 legislative election as head of the Zionist Union joint electoral list of Labor and Hatnuah. He will retire from the Knesset prior to taking up the role with The Jewish Agency on 1 August. Born in Israel in 1960, he was elected to the Knesset in 2003, serving on the Knesset Finance, Internal Affairs and Environment and Anti-Drug Abuse Committees, as well as Labor Parliamentary Group whip. He served as Minister of Housing and Construction, Minister of Tourism, Minister of Welfare and Social Services; Minister of the Diaspora and Minister of Welfare and Social Services. At the events, Herzog confronted topics including the strategic threat from Iran, strength of Israeli society, challenge of competing views of Jewish life in Israel and the Diaspora; and the vital and unique role of Keren Hayesod-UIA in funding critical projects in Israel. “The projects supported by Keren Hayesod-UIA have, and continue to make an enormous impact in Israel,” Herzog said. “Herzog’s visit to Australia was extremely timely and we were very fortunate to be able to host him at multiple UIA events. The Jewish Agency for Israel – the key institution to which Keren Hayesod-UIA directs its funds is still the most critical link between Israel and Diaspora Jewry,” UIA CEO Yair Miller OAM said. Herzog will also attend UIA events in Melbourne and Perth this week.